Gear VR edition is out! You can now download and install it and use full power of your Gear VR sensors. Scroll down for instructions and known issues. Yesterday evening our submission was approved at SideloadVR. Even without a blog post or Facebook/Twitter update some of you found the app minutes after it became available. It had several hundred downloads after few hours. It's amazing how fast you guys are! It's the first version and some bugs are present but we'll keep bugfixing everything as soon as we can. The first bugfixing update (version 2) should be available shortly after this post is published. You need SideloadVR which repackages VRidge .apk file for every user individually. It's needed because you can't easily install 3rd party Gear VR apps from outside of Oculus Store. Remember that you need to turn Gear VR service back on (with CB enabler or any other app you used to disable it) if you disabled it to use your Gear VR as cardboard viewer. If you don't do it, no Gear VR apps will launch (tapping icon will not open anything). Install SideloadVR and run one-time configuration. Start VRidge for Gear VR from your app drawer and pair it on the desktop side. Go to Browse Marker in left drawer menu. 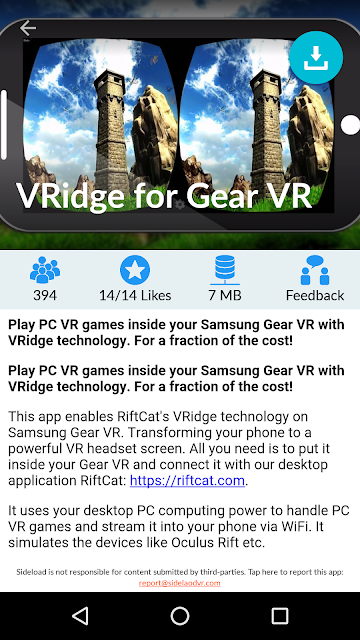 Find VRidge for Gear VR by RiftCat Sp. z o. o. and install it by clicking top right button. You will see Android app installation popup. Some Samsung devices may treat unknown apps as unsafe and you might need to confirm it multiple times that you want to install the app. Launch the VRidge for Gear VR app in your Android app launcher. Entries marked with * should be fixed with version 2 released today. Few people reported double vision because images are aligned incorrectly. Some of you noticed that the picture is not stereoscopic. You're right, the first version has left eye duplicated twice on the left and right side. This should be fixed by today's update. We were playing around with stereoscopic/monoscopic views and somehow we pushed the wrong version into release channel. Sorry! Some Samsung Android OS versions were showing big red warning that app is unsafe and you shouldn't install it. We removed some permissions and the warnings should be gone. The permissions were there because Cardboard SDK needed them. Some of you reported that they can't see anything because view is all messed up. This happens on beta version of VRidge Cardboard app too and can be fixed by disabling automatic stream fixes in mobile settings. We're disabling this by default for Gear VR edition since Samsung devices handle stream without any problems anyway and don't need those fixes - "if it ain't broke, don't fix it". Hopefully disabling those fixes won't cause any problems. We might need to add per-device user switch if it does. Some of you reported unusually high latency. Delay will be obviously bigger vs regular Gear VR apps because we need to stream frames from the PC but it should be still in comfortable range. If you experience large delays please e-mail us at support@riftcat.com and include your Samsung model number and Android OS version. You can it in Settings -> About phone screen. We will keep tuning the prediction values to reduce the latency. We might need to find the right balance between jitter and floatiness/lag. If you find the current experience comfortable, shoot us an e-mail and describe how it feels. If you give us enough feedbacks we might introduce some default presets + extra sliders so people can fine-tune the tracking. Will the windows app also get an update? It's not clear to me what needs to be selected from the Tracking source for the gear vr's sensors to be used as input. 'Phone sensors only' option is rather misleading in this context. No need to update desktop app but I agree, we need to clarify the label there. I really wanted the GearVR version to fix all the issues I had with the standard Android one but atlas no such luck. I have a Samsung S7, 2016 Gear VR headset and a GTX 970 with a Gsync monitor (I tried disabling gsync) but the experience is just not usable. Firstly, the framerate, just like the native android version, is stuttering. My gpu reports its spitting out at 58fps consistently (which might explain some stutter) on all games I have tested. However in VRidge the experience feels like 30+. The GearVR version of the app has improved the tracking, seems smoother, but at the expense of much higher latency. Also I can only run one game per session, as after I close the game the mobile app just wont connect again. I don't want to sound like a complainer, as I absolutely love the work the team is doing, and so badly want the premise to work (Stream Theater proves smooth streaming is possible! ), but until I figure out whats wrong with my setup / app I am going to pass for a few versions. I am a paying customer, and happy to be one. If anyone has any recommendations to try I am more than happy to test. My PC has a wired gigabit connection to an Asus AC88u router. The S7 is using wireless 5GHZ, with a throughput of around 260Mbs when tested. I don't think in this case its the network as all my tests show connectivity and bandwidth is good. I have tried quite a few different configurations in VRidge with bandwidth and resolution but cant get rid of the stuttery streaming. My gut feeling is that its related to the frame rate not matching the S7 refresh. Regardless of the graphic settings in the game i never get a locked 60fps (using an overlay to monitor). In fact sometimes the fps goes over 60 like Vsync is not active (even when forced in the GPU settings). I have read people complain of similar issues when using Nvidia Gamestream to stream games to a TV. Maybe the NVEC encoder on the 970 has issues, might try swapping the graphics card out for something faster. I wonder what Stream Theater uses as it doesn't seem to exhibit the same stuttering. We noticed this problem too and we're currently looking for a solution. To everyone experiencing it - please send diagnostic logs. It's easier to find patterns with more data points. I havent got the gear vr as i have an lg g4. But my experience with vridge has been very positive. The only downside is oculus rift games only natively working up to 0.8 and i havent had much success with the psmoveservice. I sold my G4 right before the V20 release and I'm currently buying a gear VR and S7 edge. I've used the move controllers before, what problem are you having? Thanks for responding. I watched your excellent video Daley Tech. I really wish my experience was the same as you have it nailed! I can only seem to power 2 ps eyes from my usb bus. Yesterday I tried a powered usb hub but still I only had enough power for 2 cameras. When 3 are plugged in I get just grey screens, or once I thought I had cracked it but I just got really jerky video. With 2 cameras and 2 ps moves I have had the really high up ps moves, or the sunk in the floor, or they appear behind you. Maybe I need to invest in a 3rd PSMove and everything will come together. I'm using a combination of USB 2.0, 3.0 and 3.1 ports since they are on different controllers. If you were to get a real cheap pcie USB 2.0 card, you could probably have that card just run 2 camera alone without any issues. Great Work guys. Only problem, a crucial feature is missing for the Gear VR client: Enter IP address manually. Because for some reason, my phone never find my computer by itself. that is no problem with the regular client as you can input a IP address manually. Right, there's no way to enter IP manually in current Gear VR client. We'll fix it. The lag problem that has plagued the app in the normal version makes a comeback in the Gear VR version. I have an S7 with snapdragon, and whenever I start the app, I get lag which is immediately noticeable when the tracking starts to heavily sway. Testing the connection, it is a 5ghz a/n at a stable 70mbps. Thinking it was the upload speed bogging it down, I tried a connection that had a solid 20mbps, and the problem reproduced itself yet again. I've checked the phone for power saving features that could be activating but nothing seems to be holding it back. Update: I don't seem to have a problem running Moonlight at 70mbps. This problem appears to be specific to RiftCat Normal and Gear VR Edition. Checking again, the desktop doesn't seem to have a problem tapping into 5-10mbps, but anything else, and the client becomes unstable. It's also inconsistent-- for example, I managed to get tethered quality streaming one day, but every time I tried starting the client on the same bandwidth, it hasn't been stable 90% of the time. If it's sort of jittery playback, we're currently gathering data on it. We have a reproducible case with out S6 but we don't know how to solve it yet. I've got it running now. It was networking problems on my end. Question to Devs. I have S7, gear vr 2016, 5GHz wifi but experience is laggy. Wen I tried cardboard version with USB tethering i was flawless. So the question is: is it possible to use gear vr version with usb tethering or some kind of direct wifi connection betwin phone and pc or maybe something else to get rid of lag. PS. Dobra robota chłopaki !!! You can create a WiFi hotspot with your phone and connect to it with your PC. Make sure to select Home when Windows asks you how to treat newly connected network so nothing gets blocked by Windows firewall. It should be a little less laggy in direct wifi connection. does this work with gear vr for vridge vrsideload version? Hi, I also have a S7, and when I initiante vridge, that appers the first image of steamvr, the big square and triangle in the front, in this moment, the image is with a lot lag when I tur my head to left or right. the image stay with flutters/tremble. In game, the same. I test with Elite dangerous and Euro Truck. the qualyty of 3d is mucth better, but with this treble, is not possible to play. Is it laggy or crashing? I have red on the OBS forum that GCN 1 chipsets have an encoder limitation of +/- 1920x1080 with 30fps with quality preset and 1920x1080 with 60fps for balanced or speed preset. Anyone knows if these presets will switch to the appropriate level according to the FPS selected in the riftcat desktop app? When I use 1080p30 everything looks great but at 1080p60 I get heavy lines of blocks no matter the bitrate selected. If a balance preset was selected would it help? Unfortunately, I get terrible stuttering no matter what my settings are. It's unplayable. Also a paying customer, so really want this gear vr version to work. No issues whatsoever with stream theater. This is definitely some issue in vridge itself. Thanks for the gear vr update, and bringing it so soon, but I hope the stuttering is fixed soon. This is with a S6, gtx 970. Hi! I tried reproducing my jittery streaming tonight, but this time it was actually very good. Barring slight jitter here and there, and some artifacts, ED was actually somewhat playable! I was using a different router over 5ghz this time round, and that seemed to have made a big difference. Can't think what else it was. I'll test on a different router in a few days to see if I get the jittery streaming again. Looking forward to future updates (especially stereoscopic display)! Thanks for the awesome product. Don't have a diagnostic log right now, but will send soon as I can repro it again. Hi there, great work on the app. Watching this really closely and will be purchasing if you fix the jitter on Samsung devices (mines a note 7). Would love to send you logs but can only send via classic app, there is no log option in the the Vridge for GearVr app downloaded from SideloadVR. The app just launches straight into GearVR mode, no options available. The problem happens both in normal and Gear VR version so you could send regular logs. Anyway I think we've got enough logs for now. This seems to happen across all hardware configurations. My question may have been asked already, but in a different way. I have an unexploded Note 7 with Gear VR 2016 which claims to have USB pass-through over USB C. Therefore can I use this via wire, and with hopefully much more reduced latency? We only heard that it supports data transfer but we haven't heard about anyone successfully using tethering with the new Gear VR. We don't have one (yet) at the office so we couldn't test it ourselves. Indeed. I'll test it for you and report back! After some hours, I can get into vridge vr app but when I start the riftcat game "Coffee without words", showed in the official tutorial, everything is messed up and the floor area is green. I'm using the low quality setup with htc m8. I've seen the Known Issues section that I have to disable automatic stream fixes in mobile settings but there is no that option. Do I have to do something else?? I've just tried another game and the same happens. This may help to diagnose the greenscreen problem. Hi all! Really good job with this release, I only had some black screen that forced me to exit the current game and start it again (inide the gear vr itself, cause steamvr was still showing). Other than that, really good job, I tried it with ps moves and have some good time playing good vr. One more thing!! I didn't read anyone using shared connection (wifi share or whatever is called) instead of normal wifi connection throw wifi router or usb thetering; I tried it (vonnecting my pc to the wifi network created with my s7) and have a great quality upgrade on my streaming to vridge! At least 720p 60fps was really really solid and with minimum latency. That's true. Direct wifi connection is definitely an upgrade over router-centered one. Black screen is something we want to fix too but we're currently trying to get rid of samsung jitters reported by many users. I've seen you say you intentionally run vridge at 58fps, but the galaxy phones all run at 60hz. How is that not introducing judder in and of itself? It's not related. Frame timing works differently wirelessly. We tested it at higher FPS. The problem lies somewhere else. We will make FPS freely configurable at some point but we want to fix jitter source first. Hi excelent Job. When i Take off the phone from the gear the sensors continue working. It uses phone sensors instead of gear sensors? If you have developer mode enabled it will use phone sensors after removing from Gear. 1. After steam vr update every game flashing during streaming. 2. Can't play Lucky's tale and some other games any more after Gear VR update. Game appears on PC screen, but deep darkness in the Gear VR. As far as we know the phone reports itself as 1080p gaming-wise. We'll research some more but I'm afraid 4k display is possible only with unprocessed media like images. Our stream is technically a video stream but it's post processed before displaying through graphics API. You can watch 4K video through the phone on the sony video app. The link above shows that it might be possible to change the screen size using wm size in a terminal (even though it might be emulated to 2k/4k) and youtube allows you to watch 1440p videos. Someone reported the same problem via e-mail. Are you using the latest version of Revive (0.9)? We haven't tested those 2 games but usually HMD check is something that is handled by Revive layer. We're working on Gear VR timings which should decrease latency. Hi, been having a blast with the GearVR version. Works brilliantly with Project Cars. I'm not sure if it is within your control but the default centering of the GearVR screen is set when VRidge is originally launched instead of the orientation the headset is facing when the side touchpad is tapped. On a side note, I'm using the S7 edge with the exynos chipset and I'm not being affected by frames in the wrong order. Maybe the SD820 chipsets are suffering from the stutter? Project car has own vr center. in the settings you could chose a button when you press that button where you glance that will be the vr center. I have been waiting for this, thx! Hi, just been messing around with the GearVR edition (paid) with Elite and Project Cars, and although the latency is still too high to be comfortable, this is really promising. The reason why people are not having any trouble with stream theater is because each frame is rendered to a canvas which is fixed in space. The canvas is orientated according to the gear's internal tracking mechanism, and thus any late frames are still in the right position relative to your head. As I would guess were never going to get latency down to the 10ms or below, is this not an option for vridge? I appreciate you are rendering a stereoscopic image so this might not be trivial, but if each frame can have its direction info encoded onto some sort of fixed canvas, it can be independently tracked and moved around by the client headset. I think this would largely kill the 'frame dragging' problem Oculus developed low-persistence to try to overcome. We've tried this kind of approach with Android side reprojection to compensate the stream round trip but we ran into some micro sync/rubberbanding jumps. We want to come back and retry it with some new tricks we learned over the last months but we are currently prioritizing bug fixing now. I tried first without the gear vr.. but just installed this one and it is so much better!!! how do I buy it????? latency is a bit of an issue, but my router is 2.4 ghz, that said... again.. WOW... I just want to buy it but I'm not sure where or how, if I buy it from the google store, will it transfer my licence to this gear vr version? There is currently only an option to buy it on our website (link available in desktop client) but yes - you buy it once and you get access to all versions. I found this "Daydream VR Develpment Board 9 Axis Posture Sensor Gyroscope" in aliexpress. If I put it on the headset and with USB connect to PC. It's working? We currently sample the Android OS sensor data so you would need route the data from the devkit to OpenTrack/FreeTrack where it can be picked up by VRidge on the desktop side. 9 Axis seems very cool. I ordered one. It's 2-3 weeks, but when I tested I'll write. Thanks guys for your continued efforts. I can now play Elite:Dangerous just about well enough to give me the VR bug. Will try DiRT and Project Cars next! Guys I have the Gear VR 2016,S7 Edge, and a Asus ROG 5272 Gaming Laptop. I'm trying to connect the Headset to the PC and have it link through the Type-C connector. I got a adapter from Micro-USB to the Type C and it looks like it connects but on the phone it only shows Mouse is connected no power or connection to PC and the App does show the service just connecting. but never makes the connection. Any thoughts on how i can get the Gear VR heaadset directly connected to the PC using the cable for the better latency connection. Can you add magnetometer tracking to GearVR version? Works almost perfectly, 1440p @ ~60 fps through 2.4 N wifi, smooth tracking, but there is a continous yaw drift. I'm using cardboard headset + oculus dev mode. We are using GearVR sensors instead of Phone's while using GearVR. So we can't really add magnetometer tracking to GearVR. What is the estimated date of next patch/release regards gear vr issues? We are constantly taking different approaches to the problems, but they prove to be hard to fix. Sadly we have no ETA right now. Will the sensors work on non samsung phones with this, It would be a live safer if it did, because many of us do not have samsung but still want to experience the best, all we need is the sensors to work no need for the oculus app.